Great news! 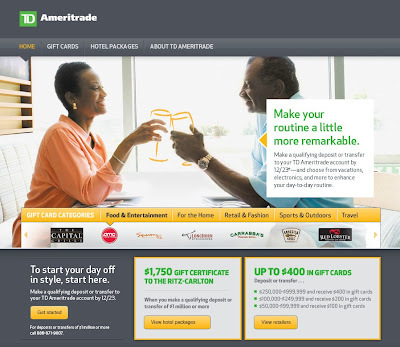 I just received an Email from TD Ameritrade with a remarkable offer. Apparently, I am one of their pre-selected clients who is eligible to receive a $1,750 gift certificate for Ritz-Carlton or Marriott Hotels. All that I need to do is deposit or transfer $1 million dollars into an Ameritrade or Amerivest account. Even if I don't qualify, I could get a $400 gift card for a deposit of only $250,000. What a deal! I know that most of my readers won't be able to benefit from this, but here is the link to this offer anyway. But seriously, I am not sure what they are thinking over at TD Ameritrade. I was going to make some additional comments, but I think the message from Ameritrade already speaks volumes. Need cash now? Get payday loans online from 60MinutePayday.co.uk today! Need money now? Get cash loans online from MyPaydayCashLoan.com today!